comfort food . . .
After a miserable day yesterday, tired out from not sleeping well for almost a week, I decided to start taking Tylenol again (just a half pill) to take the edge off of my ankle pain. G. also went out last night and rounded up some Sleepytime herbal tea which we brewed up and I drank with a spoonful of honey before going to bed. Although the night was unsettled and I had to get up a few times, there was a discernibly rounder edge to the way I felt when I woke up this morning. Translated, that means I woke up feeling more clear and a little more rested than I have for a week. Resolved to have a better day today, I washed my hair and changed to lighter weight Spring pants and top. I sewed up the tear on the back collar of my favorite lightweight sweater and wound my freshly rinsed hair into a loose knot and put a clip to hold it off of my neck to dry. We had some freshly ground pork in the fridge and some frozen shrimp in the freezer. I felt so much better than I had yesterday that I decided to make some of our favorite Asian comfort food for dinner: shrimp and pork wontons. 2. Mix 1 lb. fresh ground pork with minced shrimp. 4. Finely chop 3 leafy parts of Napa cabbage and add to meat mixture.The cabbage all but disappears in the filling but adds moisture and sweetness. Without it, the wonton filling shrinks and is less tender. 5. Season mixture with 2-3 tablespoons Ohsawa soy sauce and 1-2 tablespoons mirin. 6. Sprinkle about 2 tablespoons corn starch lightly over the mixture and work in with your hands until mixed well. The cornstarch tenderizes the filling. Let marinated meat/cabbage/shrimp mixture sit for about an hour or two before wrapping. 7. 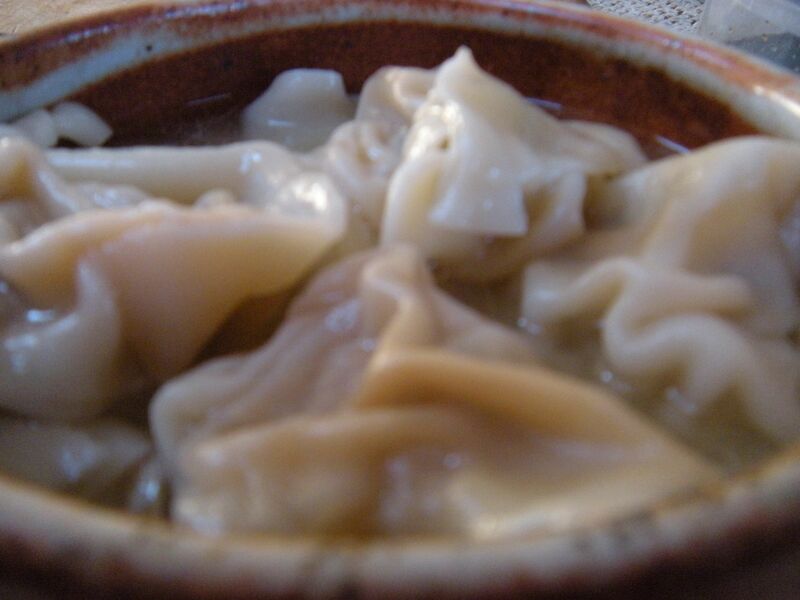 Take a wonton wrapper and put a dab of filling in the center; wet two adjacent edges of the wrapper with cold water and fold, press the edges together of the dumpling so that you have a triangle. Take the right end of the triangle and fold it under the left, securing with a dab of water. It should look like a little bonnet. Set the folded wonton onto a plate and cover with a clean dishtowel. Fold the rest of the dumplings so that edges are sealed. folded wontons ready to cook . . .
8. Bring a pot of water to a boil. When boiling, drop the wontons one at a time, stirring gently so that they don’t stick to each other. When the pot comes to a boil again, add a glass of cold tap water. Then bring to a boil once more. Add a second glass of cold tap water. When the wontons come to a boil a third time, they’re done. 9. I sometimes make a separate pot of soup consisting of chicken broth, a little water, 2 tablespoons soy; 2 tablespoons mirin. Transfer the cooked wontons into this broth, adding a little of the cooking water to enhance the soup. Serve big bowls of the steaming hot wontons, providing chopsticks and chinese soup spoons. You can also add some baby spinach at the last minute when serving the soup. 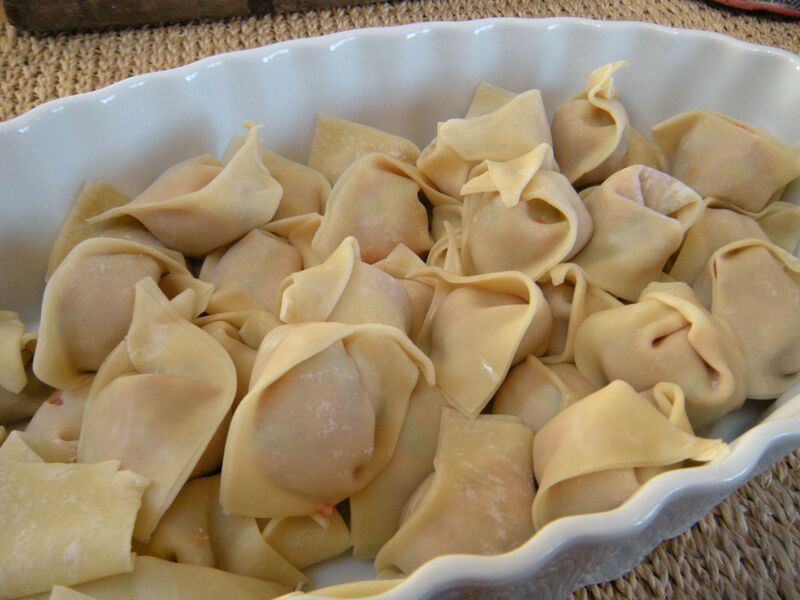 These shrimp/pork filled wontons will make your heart sing, never mind that they’re also very tasty and easy to eat! They sound delicious, just like all your yummy recipes! I also like the Sleepytime tea just before bed! Yum! Glad you had some homemade comfort to help make the edges rounder! Love you!